A gourmet treat that will leave them asking for more. Whether you want to say Thank You, Congratulations, or Job Well Done, sending one of our baskets will get the message across in a delicious way. Daily deliveries to all of Queens, New York City, Nassau, Suffolk, Brooklyn, Bronx, Staten Island, Westchester, New Jersey and Connecticut. Same day delivery in Nassau & Suffolk: Albertson, Atlantic Beach, Baldwin, Bayville, Bellerose, Bellmore, Brookville, Carle Place, Cedarhurst, Cold Spring Harbor, Commack, Dix Hills, East Meadow, East Rockaway, East Willingston, Eaton's Neck, Elmont, Floral Park, Franklin Square, Freeport, Garden City, Glen Cove, Glen Head, Glen Oaks, Great Neck, Hempstead, Herricks, Hewlett, Hicksville, Huntington, Inwood, Island Park, Island Trees, Jericho, Kings Point, Lakeview, Lattingtown, Levittown, Lido Beach, Locust Valley, Long Beach, Lynbrook, Malverne, Manhasset, Manhasset Hills, Massapequa, Melville, Merrick, Mineola, Muttontown, New Hyde Park, Oceanside, Old Bethpage, Old Brookville, Old Westbury, Oyster Bay, Plainedge, Plainview, Point Lookout, Port Washington, Rockville Centre, Roosevelt, Roslyn, Roslyn Heights, Seaford, Searingtown, Stewart Manor, Syosset, Uniondale, Valley Stream , Wantagh, West Hempstead, Wheatly Heights, Willinston Park, Woodbury. Same day delivery in Queens: Astoria, Bayside, Bellerose, Beechurst, College Point, Corona, Douglaston, Elmhurst, Flushing, Forest Hills, Fresh Meadows, Glen Oaks, Glendale, Howard Beach, Jackson Heights, Jamaica, Jamaica Estates, Kew Gardens, Little Neck, Long Island City, Malba, Maspeth, Middle Village, Ozone Park, Queens Village, Rego Park, Richmond Hill, Ridgewood, Rosedale, Sunnyside, Whitestone, Woodhaven, Woodside. Daily Deliveries to all of Manhattan, including The New York Stock Exchange and Nasdaq, Hotels & Convention Centers, Colleges & Universities. All other areas in the Tri-State area, next day delivery, including New Jersey, Connecticut, and Upstate New York. Nationwide daily shipping through UPS & Fedex. 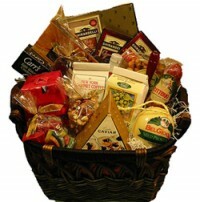 Baskets will be shipped UPS ground unless other arrangements are requested.